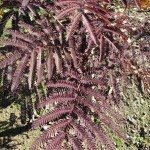 Can you stop a pink flowering mimosa from producing flowers but keep the tree? There are plant growth regulator products that professionals use to cause premature flower drop. They are usually used for nuisance fruit. Florel, Oive Stop are two popular products. 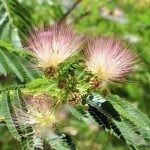 I don't know if they will work for Mimosa - Silk tree. I frankly have never had a request or known anyone who wanted to do this. They flowers are messy I know, but I would consider it a blessing and not a burden, they are so beautiful.